MINDBLOWER!! MEGA64 HITS INTERNET HARD AND HEADS TO BOSTON!! It's a crazy month here at Mega64. On top of a personal channel video that somehow became the #1 clip on Reddit, Mega64 HQ pumped out a video that got a lot of industry attention- one that once again turns to the delicious world of pizza to illustrate an important point. Check out "If Pizza Was Video Games" and see the greasy, saucy reflection of the truth! On top of the video stuff, though... we announced our plans for PAX East on our podcast, alongside some very exciting new product announcements. We'd like to take a minute to run down all of those details in writing right here! We'll be at PAX East 2018, April 5-8, in Boston all weekend long at Booth 22017! The whole gang will be there waiting to meet you, hang out, do origami, whatever! But the weekend will culminate with the "MEGA64 YOUTUBE VLOGGER APOLOGY PANEL, WE'RE SO SORRY" on Saturday night at 8PM in Albatross Theater! As usual, we'll be showing some new and retrospective stuff, banned material, and more! You won't want to miss it. But back at our booth, we're offering one of the best lineups of merch we've ever offered. Of course, we'll have all our existing classics- The 18 shirt, Electric shirts, enamel pins, Blu ray sets, and more... but the new stuff is really what everyone will be talking about! We revealed it all on Twitter this week, but we thought it'd be a good idea to compile it all in one place here. This poster won't be sold outside of the show. The artwork came from a Patreon gift (which will be on its way to our patrons very shortly) and was much demanded to be an art print. Get to the booth and get this coveted piece of art. The DREAM Hoodie and NIGHTMARE shirt, together, will certainly be one of our hottest items. We've heard a ton of people who aren't attending PAX express their frustration in getting items like this, so with these we're going to try and make it right. We are going to do an online preorder for both of these items tomorrow, March 23, starting at 10AM Pacific. It'll last for a week, and will let non-attendees order one and guarantee theirs to ship sometime after the show. Come back to our online store starting tomorrow and claim yours if you won't be at PAX. The Decay shirt will be there in person for the first time at PAX, but those who preordered these from us online a while ago will get theirs shipped around PAX time! The rest of these items will be sold for the first time (or brought back for one last time) at the show. If there's any left once it's over, the stock will make its way online. However, as anyone who attended last year will tell you, things go fast. If you're at PAX, get to our booth as early as you can! And of course, we'll have plenty of other items we haven't even mentioned. But even if none of this is what you seek... come by our booth and just say hi! It's great to see everyone out there in person and enjoy the show together. 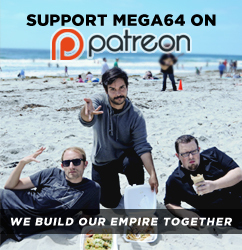 Come back tomorrow for the Dream/Nightmare preorder, but return to us Sunday for a brand new Mega64 Podcast LIVE!